Strength is an Advanced strength. Did not notice other strengths. Although the bottle suggests 2 capsules a day, I take 1, in the evening. And with that, I am obtaining what I want from this product. It’s been said that 90% of our inflammation comes from the gut. For those that experience chronic inflammation, experience chronic pain. I have taken other probiotic supplements but always experienced ‘break-through’ inflammation and pain. After taking this product my inflammation is practically nil. Which means my pain is almost nil. My bowel movements have become regular and are usually soft. Has helped with my digestive system. Guaranteed the strains will be alive and ready to work until the expiration date! Balances my good and bad bacteria. Controls my inflammation. Which in turns helps with my joint pain. Has aided in my digestion. Helps to keep my gut healthy. 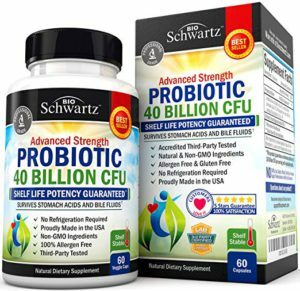 It’s 20 times more effective than other probiotic supplements that I have tried in the past. Easy to swallow. No after taste or odor. Price, I’ve taken other probiotics, that were lower in strength, but cost considerably more money! So far I have no cons with this product. As I stated I tried other probiotic supplements and by far this one has been the best working probiotic supplement. There are so many supplements out there, making so many different claims, making it somewhat difficult to choose. It is great when I find one that works–that does what it claims to do. My first 10 out of 10 rating!